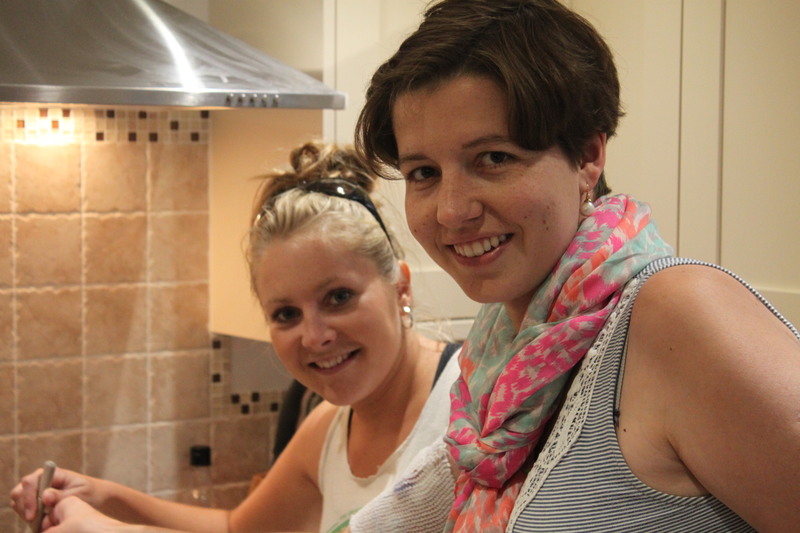 The day Lucy taught me how to make her Thai Green curry. We had our friends Lucy and Mike over for dinner. 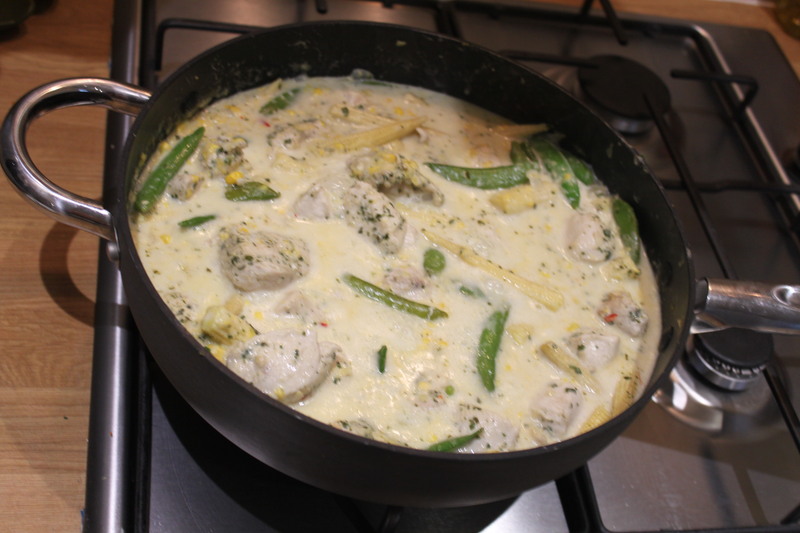 Lucy very kindly agreed to show me how to make her Thai Green curry and then share it on here. 1) Fry the onion in some oil until golden brown. Add the chopped chicken and fry until the chicken is coloured. 2) Add the Thai Green Curry herb mix, the baby sweetcorn, the mange tout, the creamed sweetcorn and the coconut milk. Also add 1 can of water. 3) Bring to the boil and let the whole mixture simmer for 15 minutes and then serve. You will obviously need rice to go with your Thai Green Curry. Do follow the instructions on the packet when you are cooking your rice. Don’t go native and convince yourself that you really do know how to cook rice without any instructions. What might happen if you do try to do it without guidance is that you will find that you have involuntarily made a really sticky rice mush and you will find yourself putting this rice mush into a sieve and running it through with water and then praying that it returns to some sort of rice grain form. This might work okay but really there will be no fooling your guests and you will feel a bit embarrassed that you haven’t even managed to successfully make simple rice. 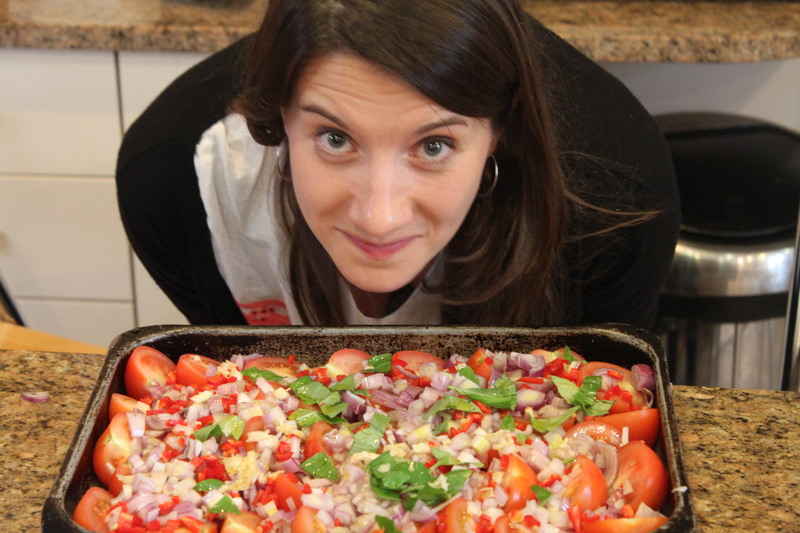 Alex inspecting the tomatoes before they go in the oven. 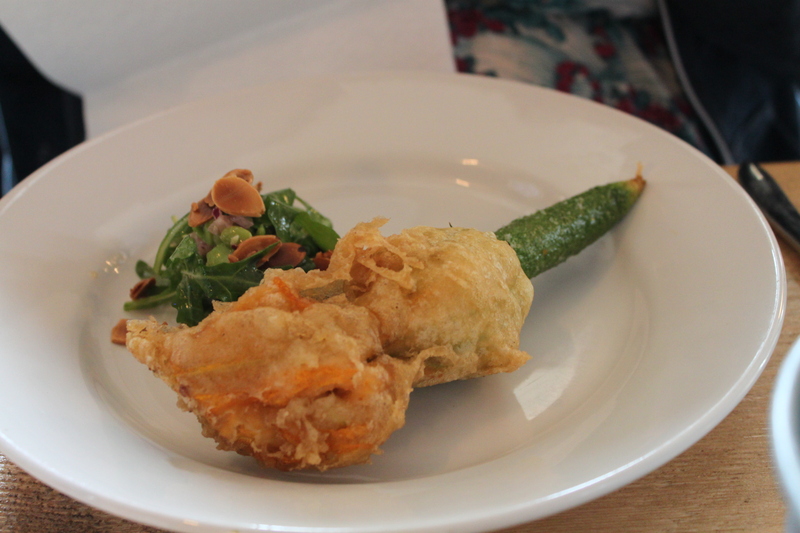 The recipe for the starter is obviously not necessary; it basically goes like this – go to Lidl and purchase some of their breaded goats cheese, put in the oven, and then serve. 1. Preheat the oven to 200˚C, gas mark 6. Toss the tomatoes, shallots, garlic, chillies and basil stalks with the oil; season. Scatter in one layer over a baking tray. Top with the chicken thighs, skin-side up; season. 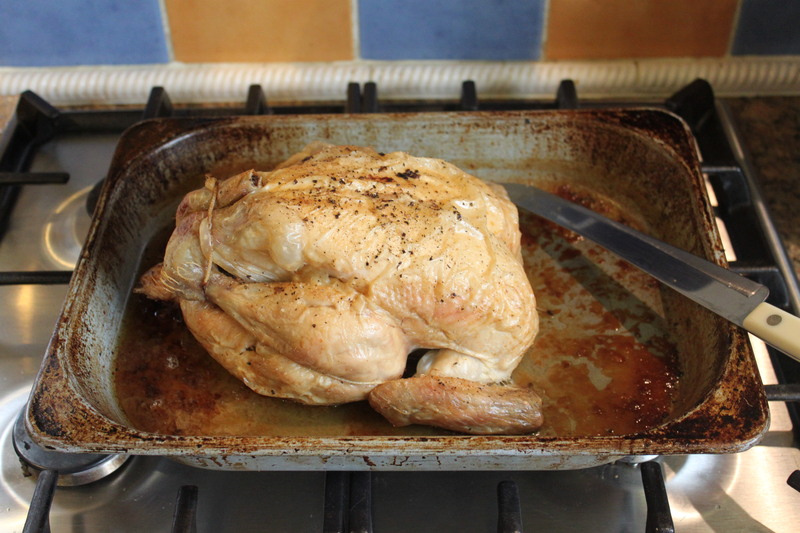 Roast for 45-55 minutes, until the veg are soft and the chicken is thoroughly cooked, with no pink meat and the juices run clear. 2. Set the chicken aside, cool and shred; discard the skin and bones. Blitz everything else in a food processor until smooth, in batches, if needed. 3. 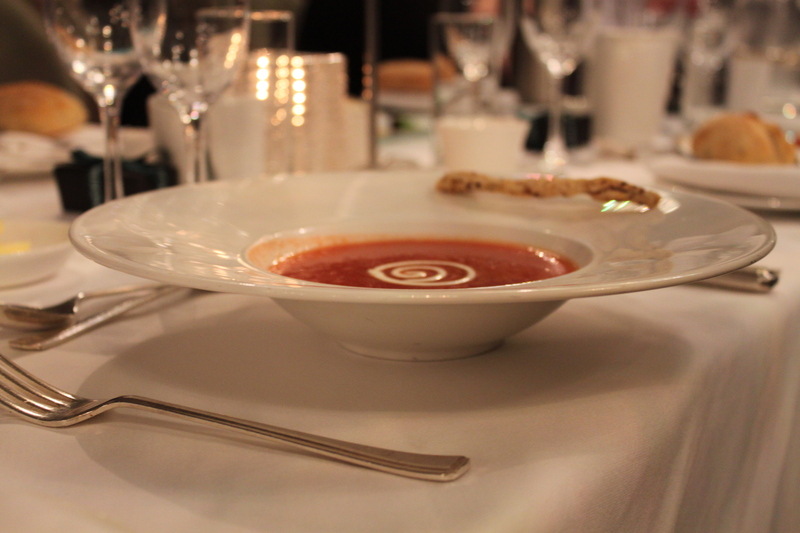 Transfer the soup to a pan and add 200-300ml water until smooth. Add the beans and most of the chicken; simmer for 5 minutes. Stir in most of the basil leaves. Serve, topped with the remaining basil and chicken. I pretty much kept to the recipe except instead of using chicken thighs I used a whole chicken. Whole chickens have been a total revelation for me. I used to be really scared about roasting them as I was convinced I would underdo them and give everyone salmonella food poisoning. In fact, as long as they don’t come with giblets, they couldn’t be easier to do and they are much cheaper than buying the equivalent weight of chicken filets or breasts. 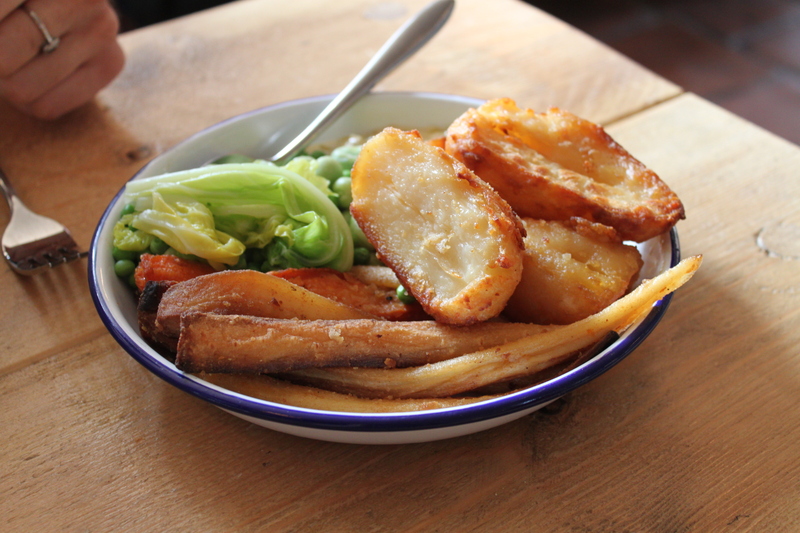 I bought the chicken for this recipe from our local butchers and although you do pay slightly more than you would do in the supermarket I think it is worth it as the chicken went much further than a supermarket equivalent. 1) Mix the chopped peaches with the raspberries, rum and peach juice. Cut the cake into slices and make sandwiches with the jam, cut these into fingers or cubes. Divide the cake cubes between 6 or 8 small glasses and spoon some fruit mixture into each, letting the juice soak into the sponge. 2) Beat the mascarpone and lemon curd together. Whip the cream to soft peaks. Fold half of the cream into the mascarpone mix and spoon some onto the fruit. 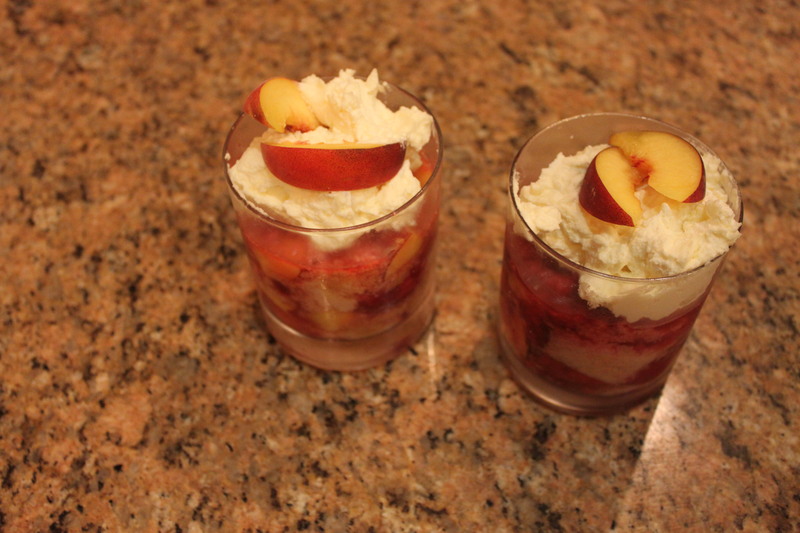 Whip the cream a little more and finish the trifles with a spoonful of cream and the remaining peach wedges. Again I pretty much followed this recipe to the letter. It worked really well and I particularly enjoyed the super boozy flavour that the rum provided. 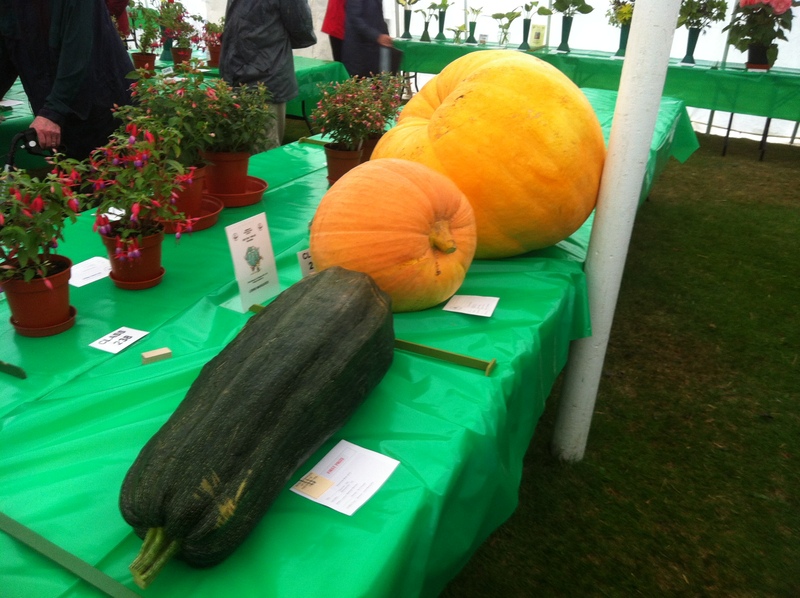 The day I entered the Emsworth Show. Winner of the Phillips Tankard. 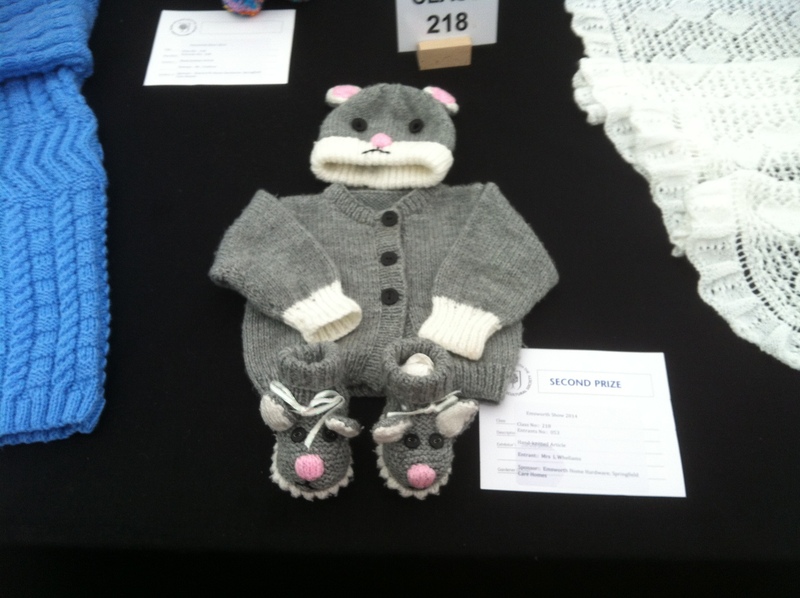 I want to learn to knit so I can make one of these. First prize in the ‘4 Decorated Biscuits’ class. 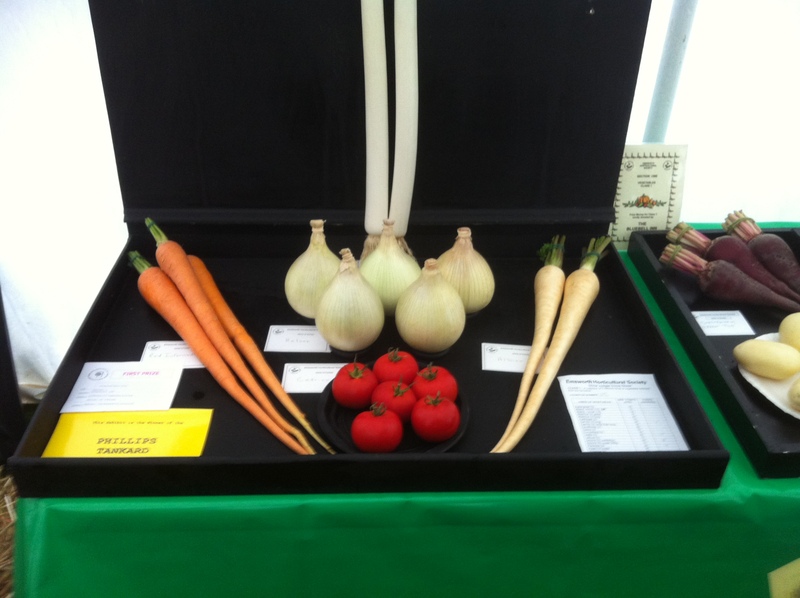 So the Emsworth show, for those of you who are not in the know, is something of an institution in these parts. It happens every August Bank Holiday Monday come rain or shine and it is magnificent. http://www.emsworthshow.org.uk/ You can pretty much find everything you could ever imagine at a village fete at the Emsworth show and then you can also find much more. One year my friend Pippa came to visit and the bee keeping society made a pretty concerted effort to recruit her to bee keeping. They didn’t, unfortunately, succeed. I always love the dog competition and the birds of prey but my favourite is undoubtedly the marquee and everything that it contains. From Victoria sandwiches to giant vegetables, every base is covered. 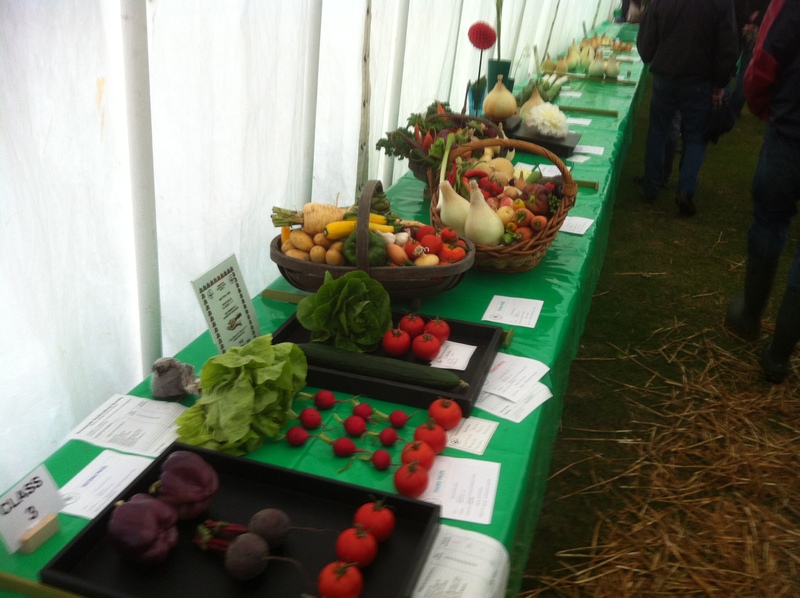 I have never previously exhibited in the tent so this year was my first attempt at Emsworth Show glory. I was, at first, a little reluctant at first to enter the baking competition but my Mother was insistent that I should give the general public a chance to see what I have been cooking up in the kitchen chez Corn. ‘Fine’, I said, ‘I will enter something, how about I enter the Victoria sandwich competition?’ ‘A bad idea’, advised my Father, ‘far too much competition for a show novice’. ‘Okay’, said I, ‘I will enter the Lemon Drizzle’, ‘Again a bad idea’ counselled Pa Pa ‘Your sister is entering that category and I don’t think you two should be in direct competition’. 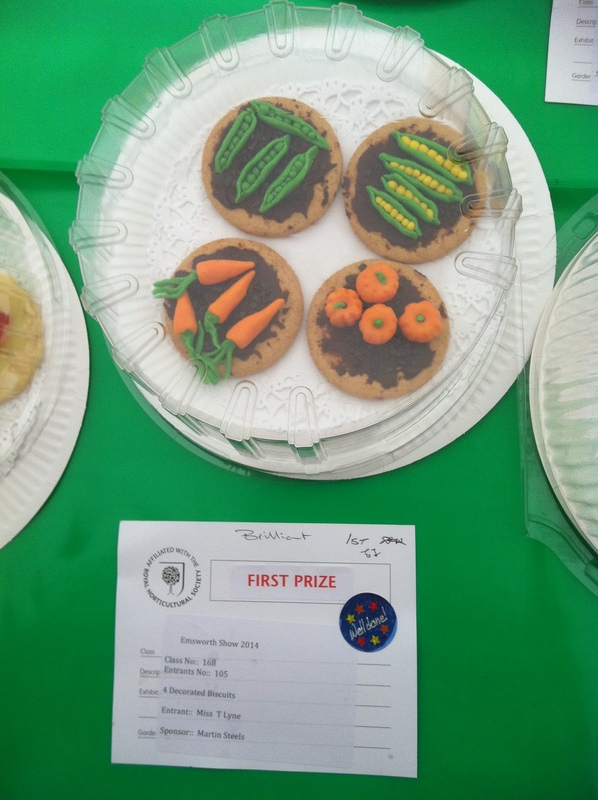 My sister, Rosie, entered the Emsworth Show Bakewell Tart category last year and won so she has excellent show form. I was certainly not willing to challenge her for any baking title. ‘Right’, I decided ‘the Tray Bake it shall be’. So we had agreed, I was to enter Five Tray Bake Pieces and Rosie, riding high on the wave of last year’s success, would enter the Lemon Drizzle and the Bakewell Tart. I have been waking early these days (a side effect of the steroids) so I fairly reliably rise at about six or half past. I therefore concluded I had enough time on the morning of the show to bake my tray bake before the nine o’clock deadline. The fresher the better I thought, fairly foolishly it turns out. I chose to bake Angela Neilsen’s Raspberry and pine nut bars http://www.bbcgoodfood.com/recipes/2381/raspberry-and-pine-nut-bars. 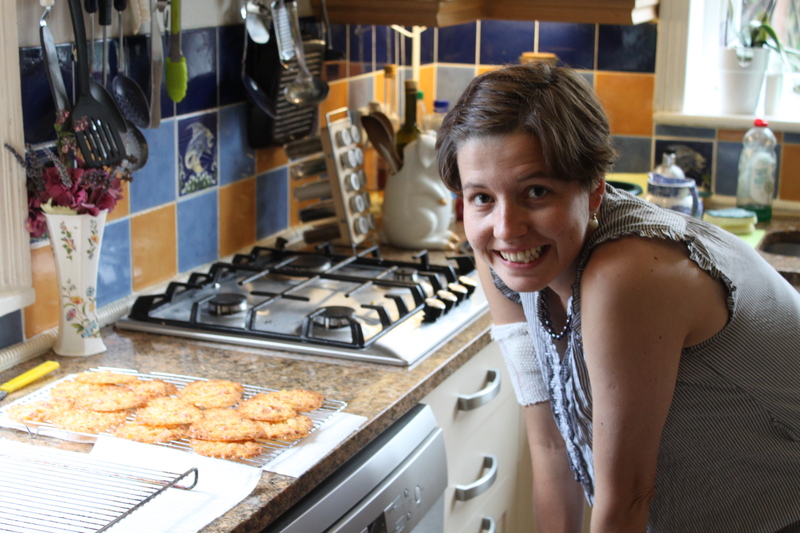 The lovely Phoebe very kindly baked these for us and they were delicious so she gave me the recipe. 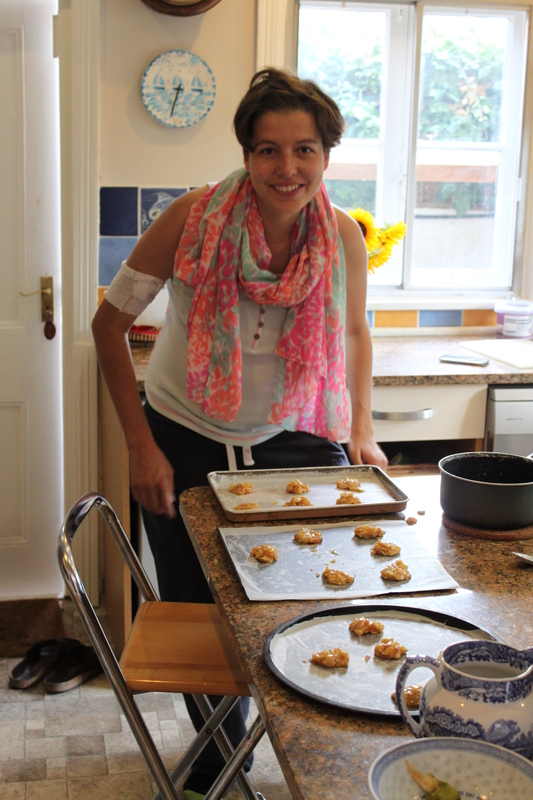 At six thirty I rose and started to bake my pine nut bars. They were quite simple to bake and I was very pleased with the results as I put them into the oven. What I belatedly realised was although I had budgeted enough time to bake the bars, I had not allowed myself enough time for the bars to cool. I removed the bars from the oven and they looked great. They definitely did not however look like they were going to hold their shape without first cooling them. It soon became apparent that I was going to have to actively cool the bars as room temperature would not be quick enough. Despite my fear that I was going to melt the inside of my Mother’s freezer, I put my bars into it for a chill. It worked – to a certain extent. At ten minutes to nine I took my bars out of the freezer. Although the instructions were no more specific than ‘Five pieces of Tray Bake’, instinct told me I probably ought to be entering centre instead of edge pieces. Unfortunately with the hurried cooling, the only pieces that were set were edge pieces. As I plated up five edge pieces, I bet my Mother that I would be told off for entering them. ‘Just do it’, she wisely said, ‘we are running out of time now’. Sadly my Tray Bakes did not even place at the Emsworth Show. 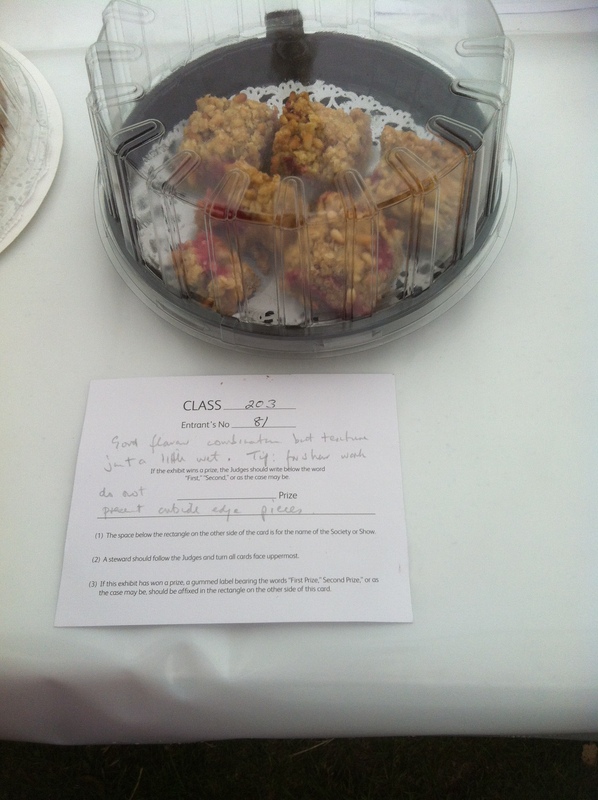 These were my judges comments: ‘Good flavour combination but texture just a little wet. Tip: for show work do not present outside edge pieces’. So in my first attempt at show baking, I had broken an unwritten rule. At least I could console myself by knowing that I was right; show baking is a minefield of unwritten rules and I failed to successfully negotiate them this year. Rosie had better luck. She placed third in both of her categories, in the Lemon Drizzle this was a particular achievement as there were eight other entries in this class. The day itself was sadly also a bit of a write off. 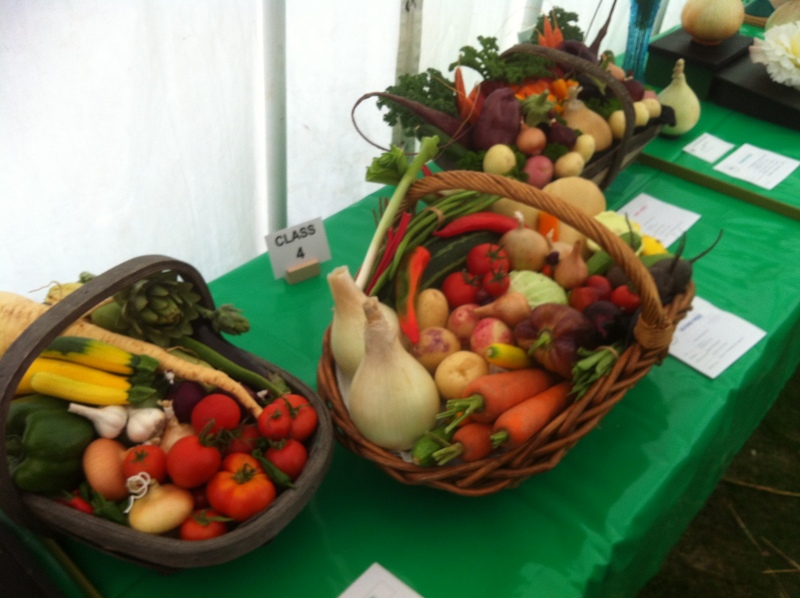 The general rule is that the sun always shines for the Emsworth show. Unfortunately 2014 was the exception that proves the rule. Bank holiday Monday was the wettest day of the summer and the show ground felt like a weeping shadow of it’s normal self. It was not all doom and gloom as the tray bakes, despite their surprisingly hefty price tag (who’d have thought that pine nuts were £3 per 100g! ), were still extremely tasty. In terms of my competitive baking career, we will put the Emsworth Show 2014 down to experience and prey for better fortune next year. 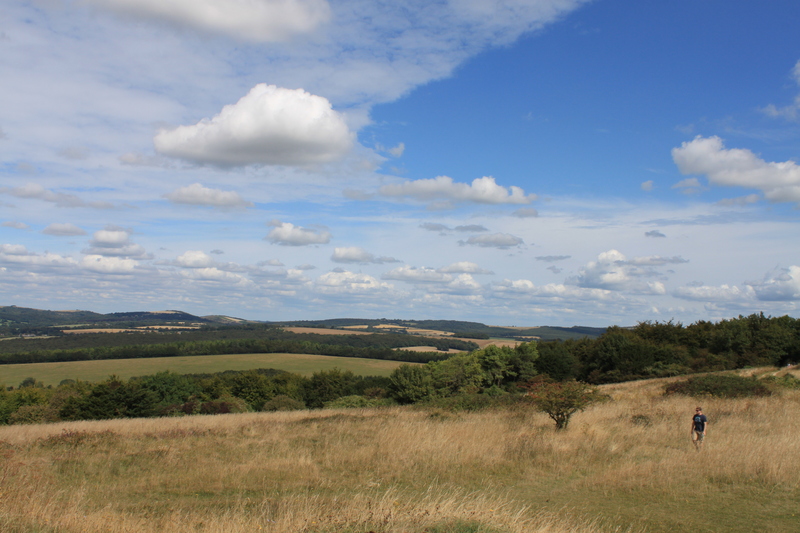 View from the bench half way up Kingley Vale. 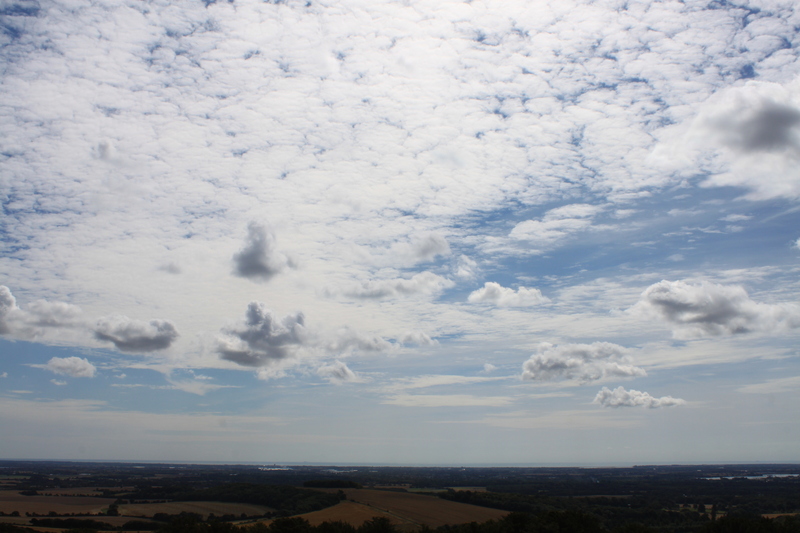 View over Chichester Harbour to the Isle of Wight from the top of Kingley Vale. 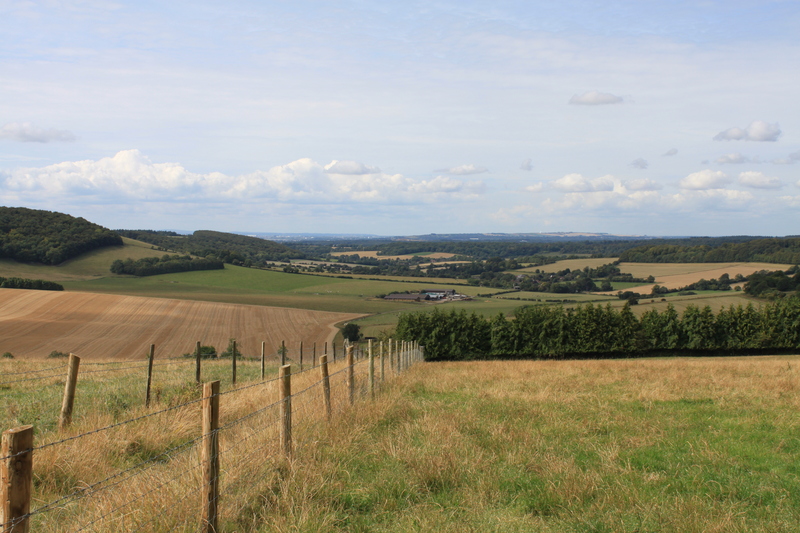 View over the South Downs from the top of Kingley Vale – can you see Mark? 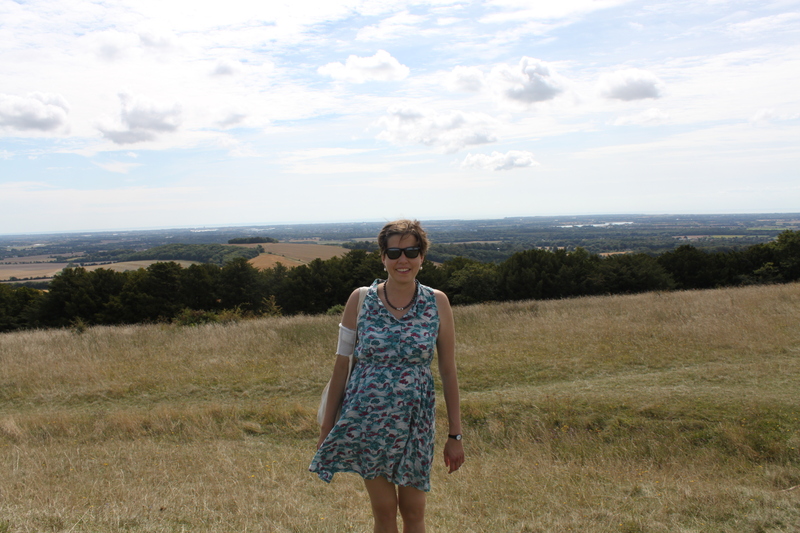 Kate at the top of Kingley Vale – Hurray! 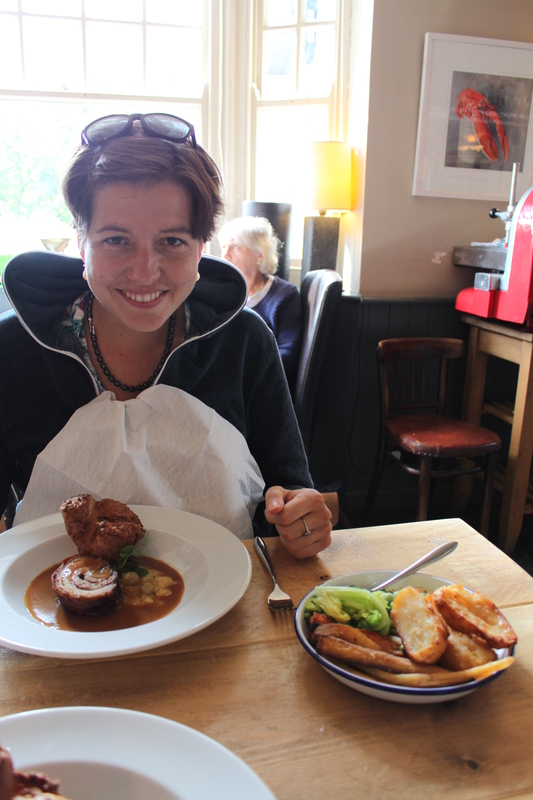 Kate with the roast, the trimmings, and a very attractive bib which Mark should probably have told her about before he took the photo. 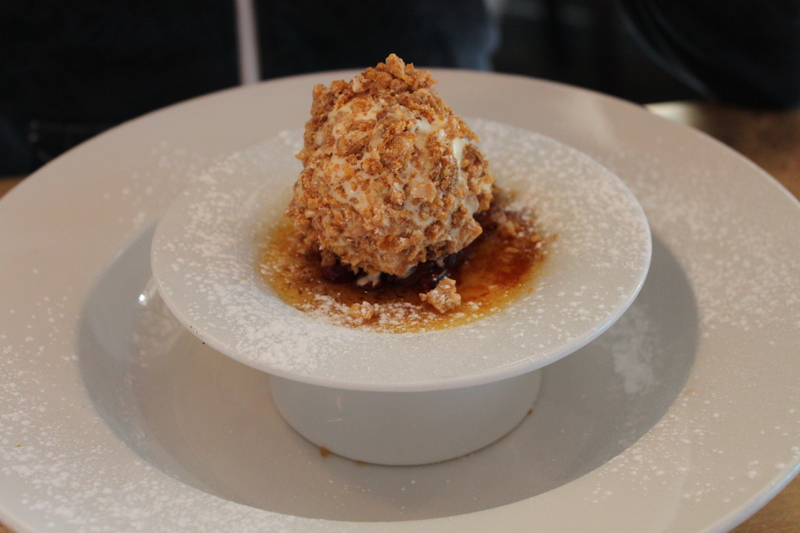 Kate’s crème brulee with cherries and a cornflake crunch. 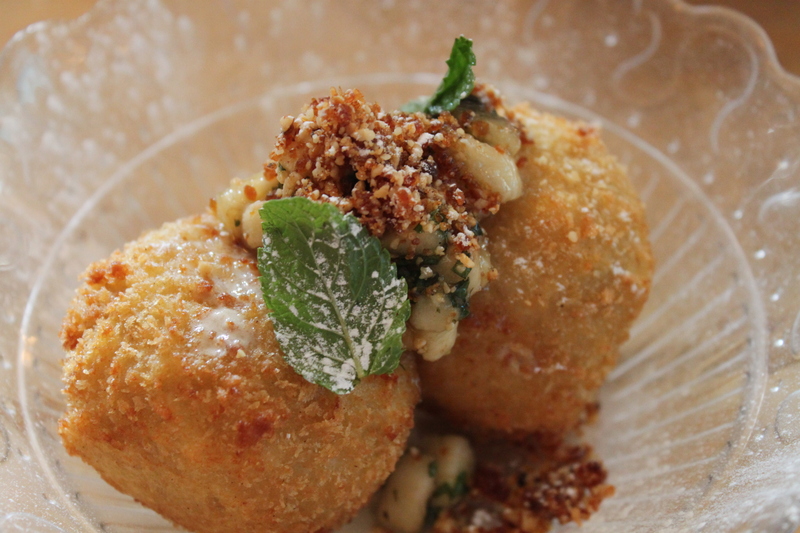 Mark’s peanut butter ice cream balls. So back when I was really unwell and out of fear was refusing to go to the doctor, Mark set me a challenge. ‘If you are truly a well person and you truly therefore do not need to go to the doctor’ he said, ‘then you will demonstrate this to me by climbing Kingley Vale’. ‘Fine’ I said, ‘we will do it this weekend’. As it was we never made it to the weekend as I was hospitalised first. It was probably a good thing we didn’t make it to the weekend as climbing Kingley Vale would have probably killed me. Anyway that was then but this is now, and I have felt for a long time that climbing Kingley Vale would be a real way to show both myself and everyone else that I am recovering really well. And on Saturday, we did it. We didn’t, as my Dad suggested, cycle up as I don’t think I’m quite well enough for that yet. But climb it we did and it felt amazing. The only real pains that I had were in my legs, not cancerous pains but healthy and muscular pains. The kind of pains you might get if you have legs that have not climbed hills for quite a few months. This pub is incredible and well worth a visit, even from afar. It is not cheap though so save it for a treat. We feasted on 3 courses and so good was the food that Mark said some words that I have never before heard him say, ‘I’m so glad we ordered desert’. 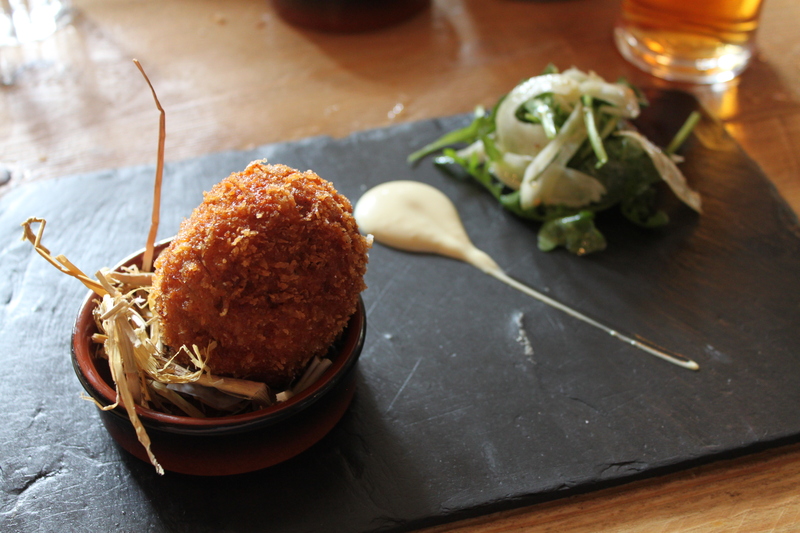 Mark was very mean and for starter ordered the Hot and runny chorizo Scotch egg, saffron aioli, pickled fennel. I currently have to be really careful with my eating to minimise the risk of infection and so can’t have runny eggs. I have decided out of all the things that I am currently not allowed to eat, runny eggs are the things I am missing the most and Mark’s scotch egg ran beautifully, in front of me, and all over his plate. I made Mark promise that for my birthday next year he makes me a plate of runny eggs and then I can eat them to my heart’s content. 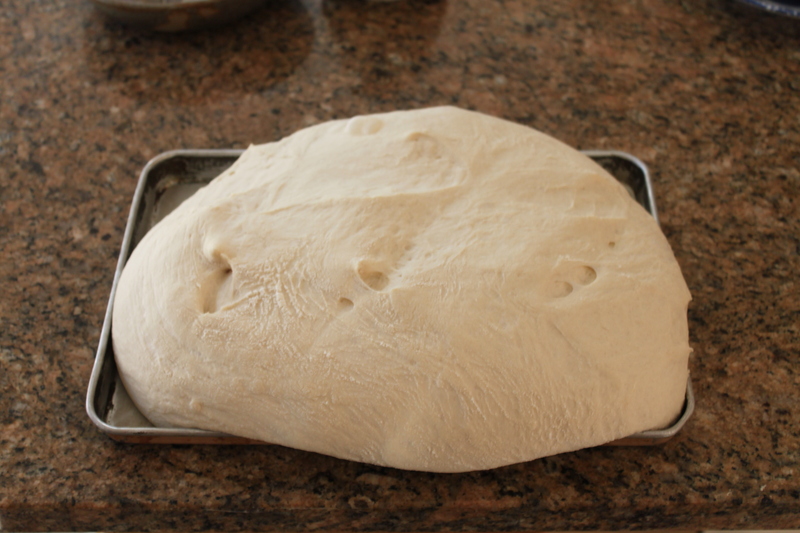 Dough after first prove – definitely needed a bigger tin. The bread snail is ready to go. There is nothing better than the smell of fresh bread. So this week was bread week on the Great British Bake Off. I fondly remembered Jamie’s Nutella and Banana Bread that I used to make as a teenager and thought this was the perfect reason to resurrect the recipe. So old is the recipe that it doesn’t appear online so I will post it here instead. Preheat the oven to 200°C. Dissolve the yeast and honey (or sugar) in half the tepid water. Kneading! 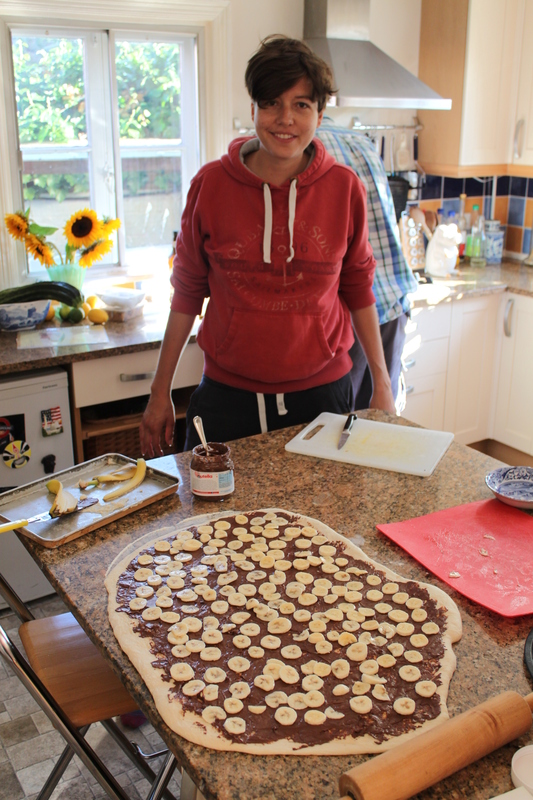 This is the best bit, just rolling, pushing and folding the dough over and over for 5 minutes. This develops the gluten and the structure of the dough. If any of the dough sticks to your hands, just rub them together with a little extra flour. Flour both your hands well, and lightly flour the top of the dough. Make it into a roundish shape and place on a baking tray. Deeply score the dough with a knife – allowing it to relax and prove with ease. Leave it to prove until it’s doubled in size. Ideally you want a warm, moist, draught-free place for the quickest prove, for example near a warm cooker, in the airing cupboard or just in a warmish room, and you can even cover it with clingfilm if you want to speed things up. This proving process improves the flavour and texture of the dough and should take around 40 minutes, depending on the conditions. When the dough has doubled in size you need to knock the air out it by bashing it around for a minute. On a lightly floured surface, roll the dough into a large flat shape (about 1/2 inch thick, 15 inches long and 12 – 15 inches wide). Heat the jar of nutella (without the lid on) in the microwave for 25 seconds to soften the nutella. Use a palette knife to spread the nutella evenly all over the bread. Arrange the sliced bananas all over the bread. 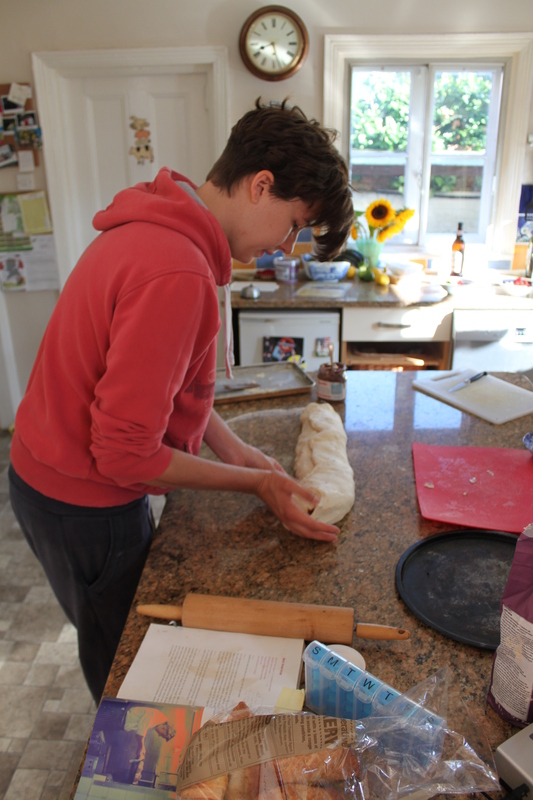 Roll up the dough length ways, in the same way that you would roll a swiss roll. 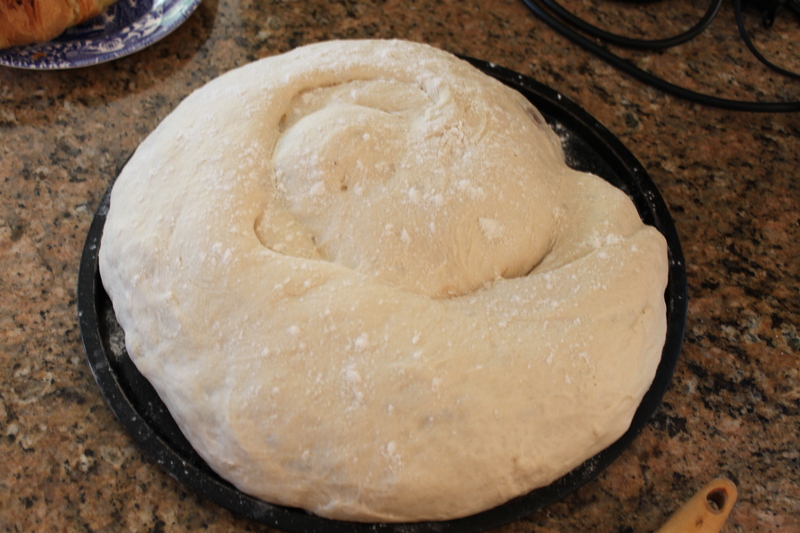 Then curl the rolled dough around to make a snail shape. Transfer the bread roll to a baking tray. 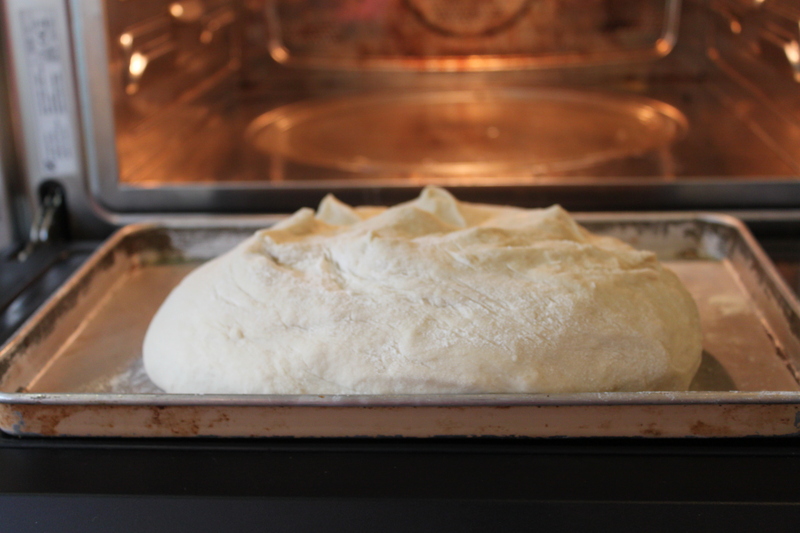 Be careful when doing this as the dough will need to be coaxed slowly away from the surface underneath. Prove the dough for 15 minutes. Bake in the oven for approximately 25 minutes or until golden brown on top. 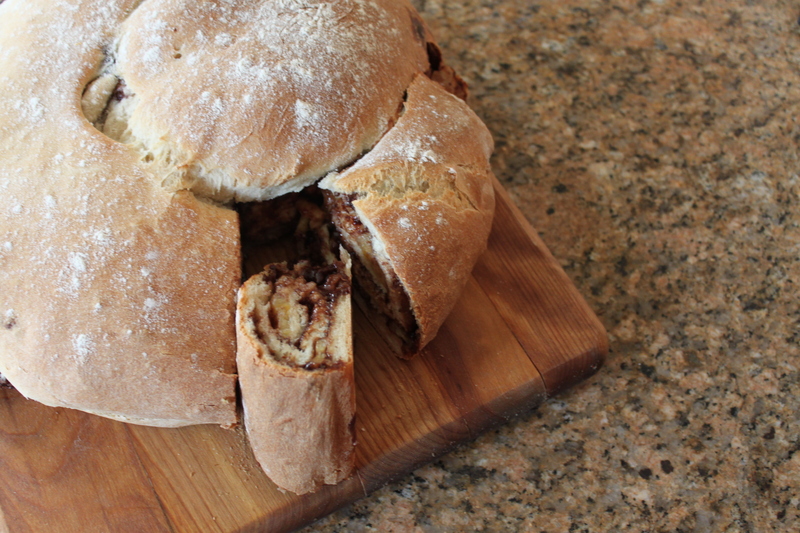 1) This bread is really yummy so do make it and have it for Sunday breakfast as the smell of fresh bread will make you popular with everyone else in the house. 2) Paul Hollywood would have been cross if he had been judging this bread on the Great British Bake Off as in the centre some of the dough was still raw. This is unfortunately a side effect of the roll. Next time I might just try rolling into a large sausage and not then rolling into a snail shape because although this would not be as attractive, it would hopefully give a more even bake throughout the bread. 3) The bread dough calls for 30g of salt. This is actually quite a lot of salt and you can distinctly taste it in the dough. I liked the contrast of the salty dough against the sweet filling but if you are not such a salt fan then you might wish to reduce the amount of salt in the dough. 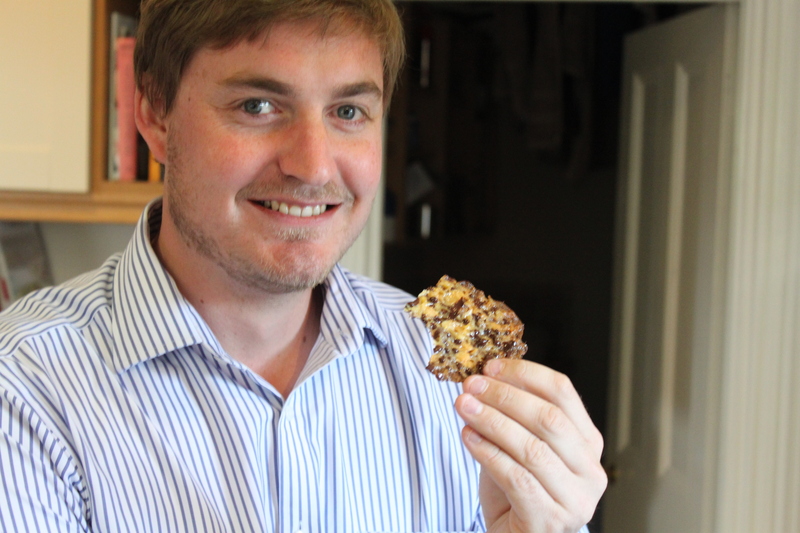 My first taster – he was very pleased. The underside – after successful chocolate redistribution. 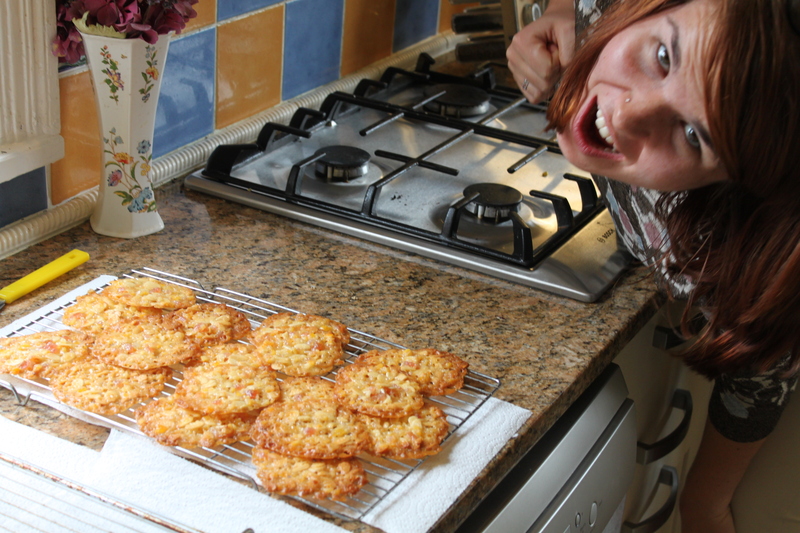 Rosie trying to eat Kate’s Florentines. 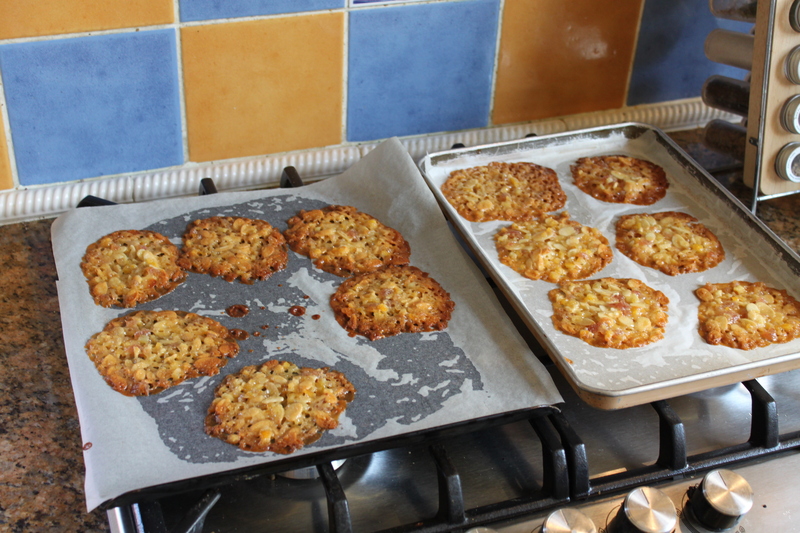 The Florentines are ready to be baked! 1) Be brave, if you fancy it, and disobey Queen Mary. I like a flaky almond in my Florentine and I also don’t like walnuts so I didn’t add any walnuts and simply added 50g of flaked (not crushed) almonds instead. It worked really well. 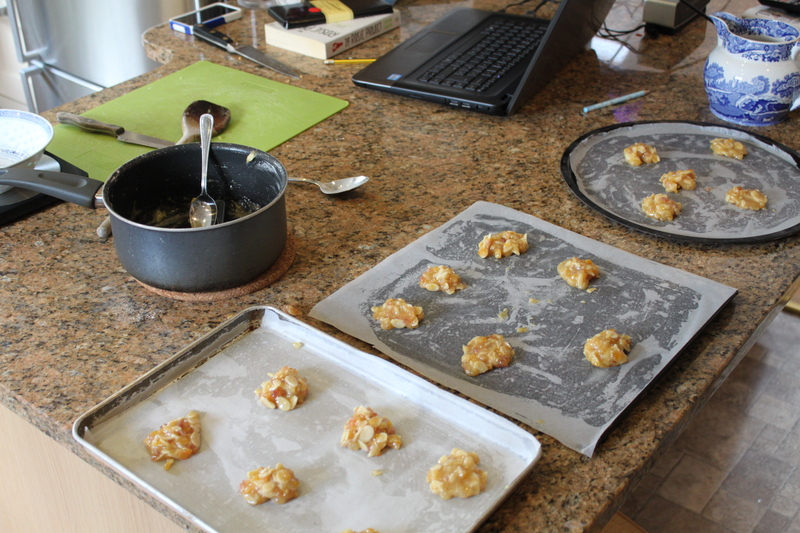 Thankfully, after further consideration, I remembered my place and did use 3 baking sheets for my 18 little balls. This is entirely necessary, even if you do have to play baking sheet Tetris with your oven, as the Florentines really do spread during baking. 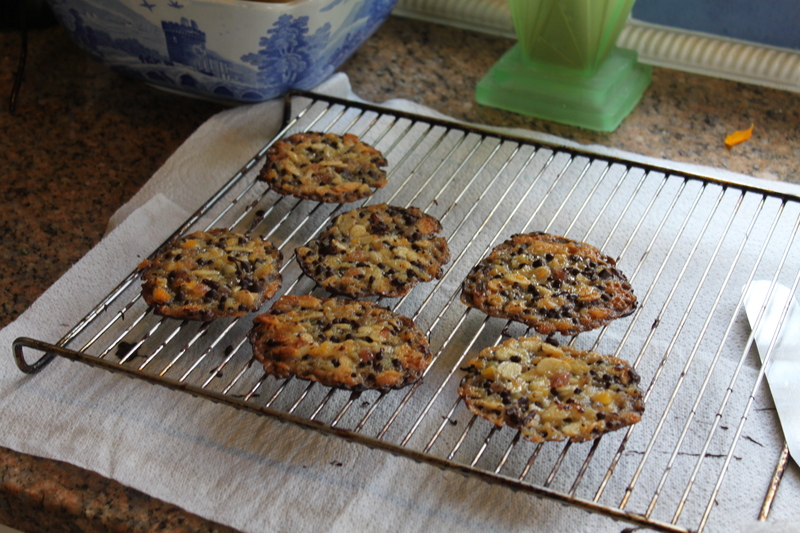 3) Don’t be greedy and put too much chocolate on the first 10 Florentines. It means that you will have to scrape some of the chocolate off the early Florentines to make sure that that later Florentines also have chocolate as well. 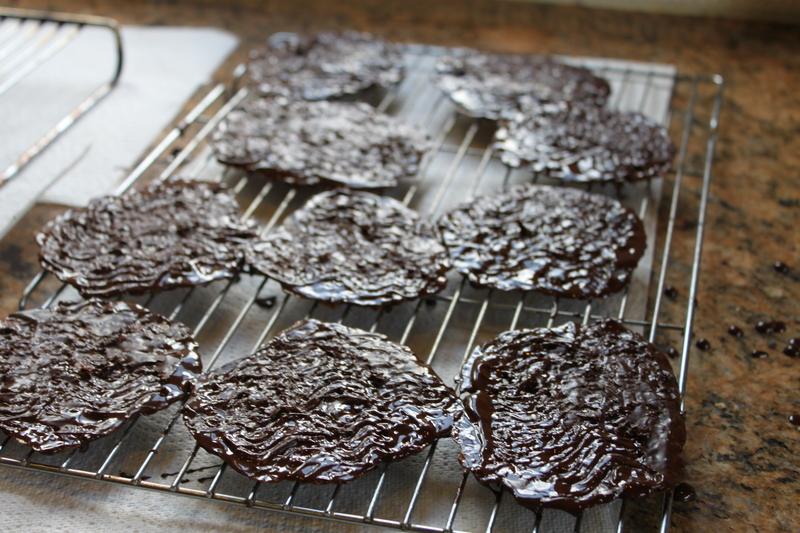 I also suspect that had I not thinned out the chocolate layer on the early Florentines, it would have ultimately taken a ridiculously long period of time to dry. Soup!! Taken in a very arty fashion of course. 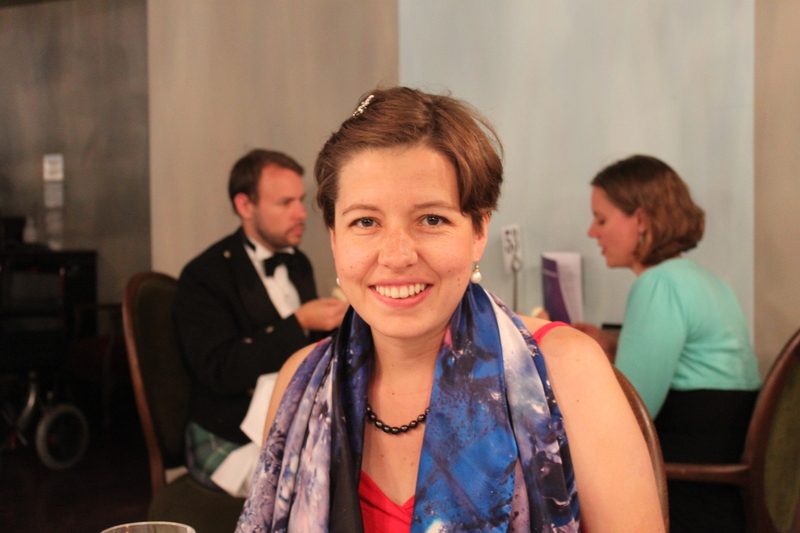 Kate with her AMAZING new scarf. 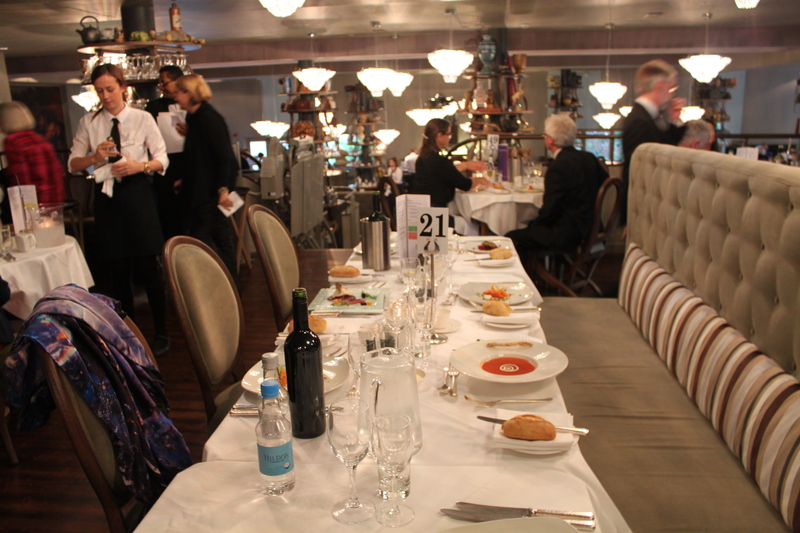 Paparazzi numero 1 – can you see Kate & Mark? 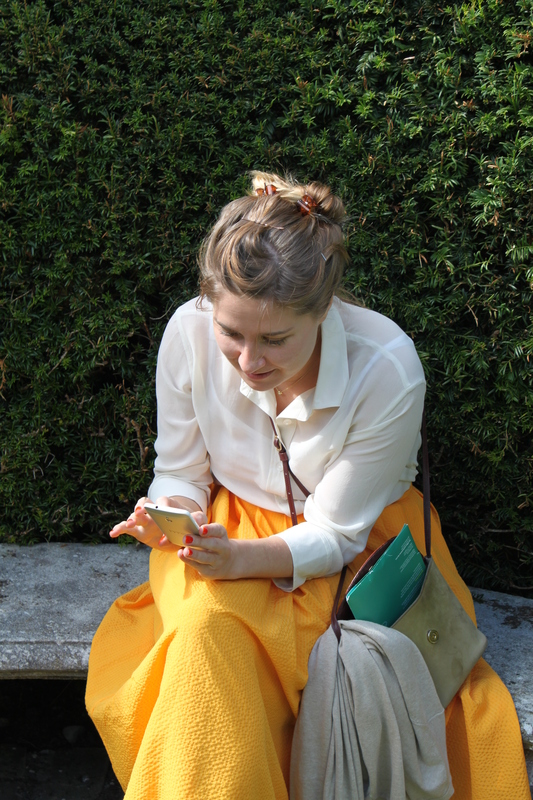 Paparazzi numero 2 – similar as you are still looking for Kate & Mark but they are now doing different things! Paparazzi numero 3 – just because the best things come in 3s. Kate and the fabulous Anna. 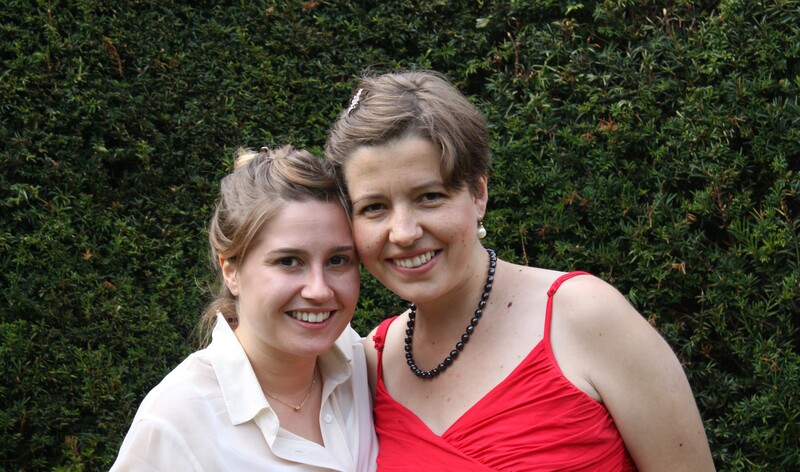 Kate and the lovely Henriette. 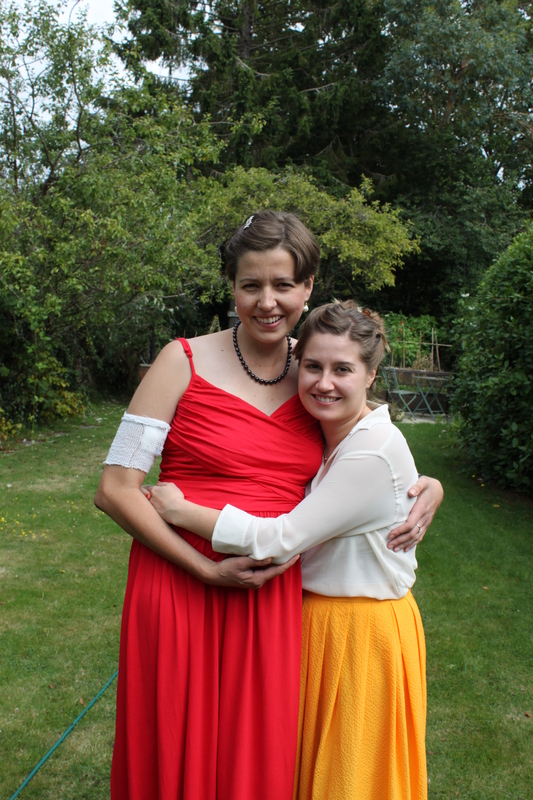 Kate and the tremendous ‘carer’. 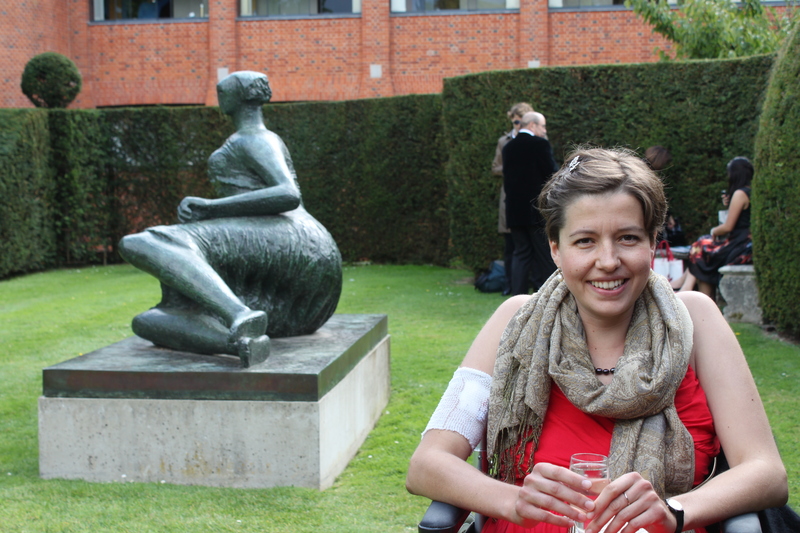 Kate, the old scarf, and a bottom made by Henry Moore. Kate and the wonderful Het. 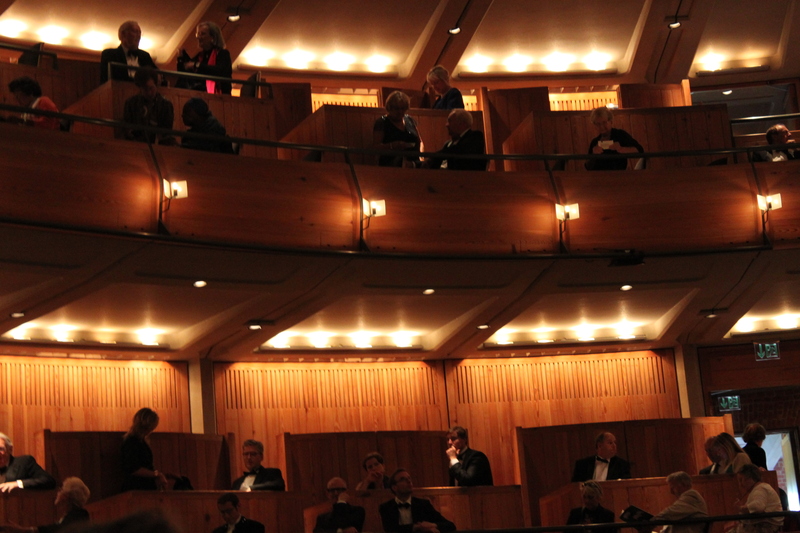 So we went to Glyndebourne and it was magnificent. And I had to behave like a good disabled person for the day and sit in my wheelchair. I don’t use my wheelchair ordinarily anymore as I am well aware of my limits (long but gentle coastal walks) and I don’t like to stray beyond them. 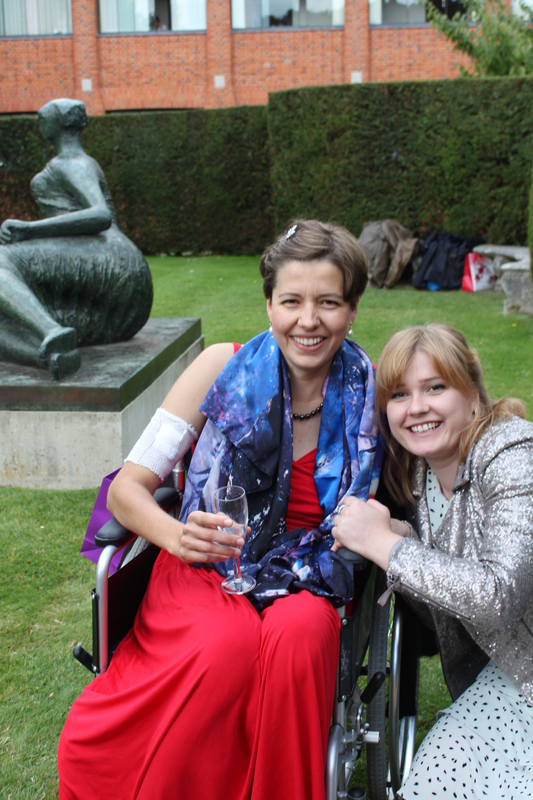 At Glyndebourne however the wheelchair turned out to be a welcome addition to our party as I was able to sit in the wheelchair throughout the performance and it was much comfier than the opera seats. It is also very useful for alerting people to the fact that I’m actually ill! 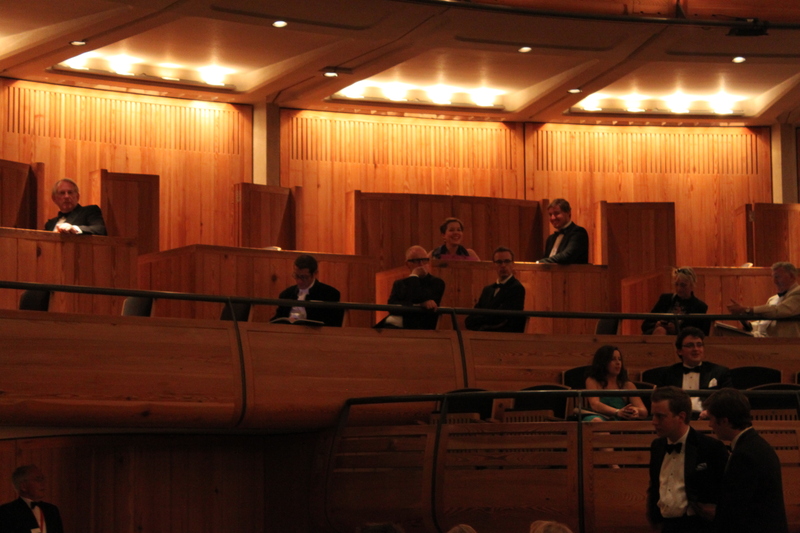 Also, since Mark had very kindly been gifted a complimentary ‘carers’ ticket to the performance it might have looked slightly odd if there was no one for him to visibly care for. 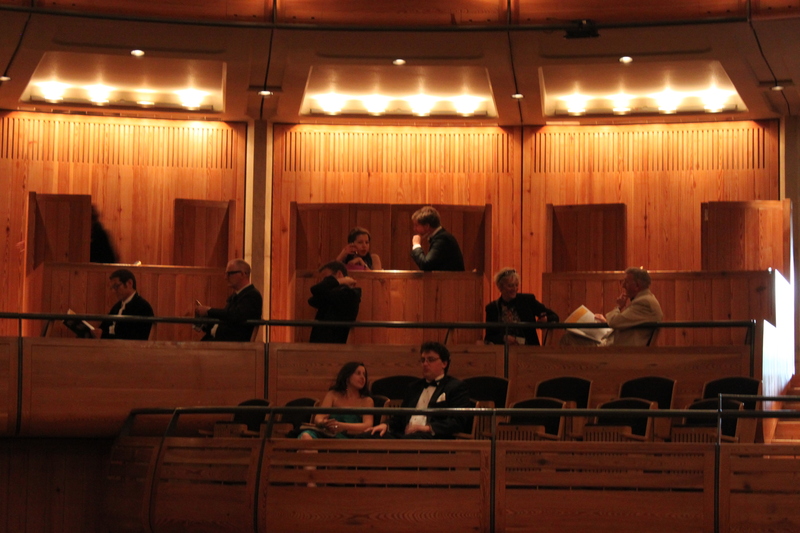 We saw La finta giardiniera, an early Mozart, and I very much enjoyed the lovely music. Leaving after the first half I was confident that I knew what was going on. Listening to Mark and Hetti discuss the plot it seems that I had no idea – ah the joys of chemo brain! 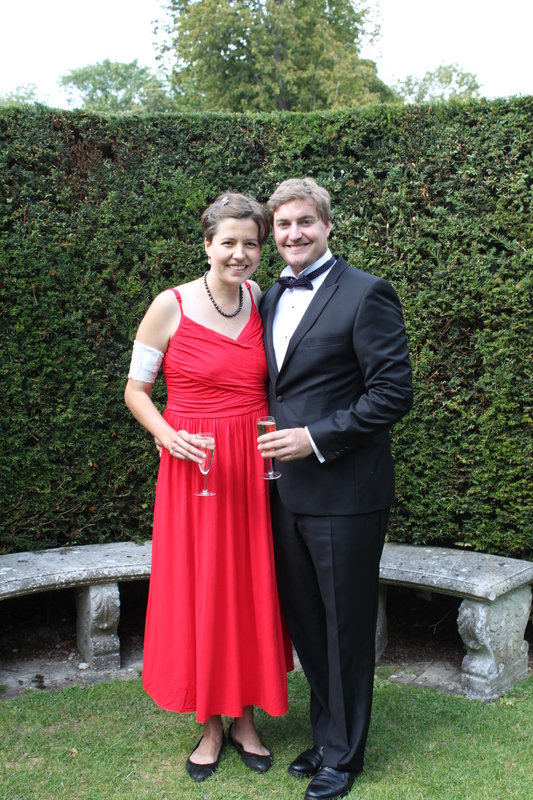 We wined and dined in a splendid fashion in Middle & Over Wallop during the interval. As a note to all other ‘wheelies’ out there, make sure your ‘carer’ is up for a push as the slope up to the disabled access was pretty steep and there were a few interesting moments; particularly on the way down. Anyway after all this sitting and eating I was feeling more than ready for a little nap. So the second half was mainly spent lightly dozing while listening to still very pleasant music and having increasingly less understanding of what was going on. This would have all been fine and I wouldn’t have bothered anyone but then right at the most silent bit of the piece, when there was a dramatic pause to allow the audience to savour the singers great song, I did a bit of a wiggle in the wheelchair to get more comfortable. This wiggle caused the empty water bottle in the back of the wheelchair to leap out of the wheelchair onto the hard wooden floor and bounce around making a noise that reverberated around the entire auditorium. The audience all turned to stare, the performers turned to stare, thankfully Mark and I managed not to giggle and just hung our heads in shame instead! So ladies and gentlemen if you want to make an impression at the opera, that is how.